6.8 ACR Pistol – We Take It Hunting! I’ve heard about the Bushmaster ACR as long as I can remember. Jonathan had talked about it forever and would say “It’s just a better mousetrap” when comparing it to the AR-15 platform. My first ACR experience outside of a gun store was when Jonathan brought his SBR out to the farm and ran it with a Franklin Binary Trigger and it left a good impression on me and the hogs. Needless to say I was pretty stoked when I went to go pick up the Bushmaster ACR pistol from DFW Shooting Sports a couple of months ago. Now this pistol was a little different from Jonathan’s SBR because it didn’t have any sort of pistol brace on it. It’s like the pistol just abruptly ends. If you think it’s awkward to see someone play the air guitar in public, you should see someone try to do a cheek weld on an air brace in a gun store. Thankfully, this wasn’t an issue for long because a package from Dan Haga Designs showed up in the mail a couple of days before the gun arrived. For those of you that don’t know, Dan has designed an incredible pistol brace for the ACR that utilizes the Gear Head Works Tailhook Mod 1. I rushed home, eagerly wanting to play with the new acquisition but knew that daddy duty would take precedence and needed to help put the two youngest kids to bed before playtime began. With my eight year old still up, I decided to grab the gun….umm…excuse me, I mean pistol from the safe. While my oldest daughter doesn’t act like she is into hunting or shooting yet, she’s always interested to see what is going to the farm with us. Times like this are also a great time to continue her gun safety education and allows us to discuss other gun related topics. Generally speaking, Christmas time at our house means that I spend hours of my life putting items together for the kids. Two years ago it was a climbing dome for the backyard. This was done outside on Christmas Eve (which eventually carried over into Christmas morning) in the freezing cold, pretty much by myself. Four hours later and a very sore body, we had a climbing dome. This year it was bunkbeds from Ikea. Enough said. So when I was told that the ACR brace installation required no tools, I was beyond euphoric. It is hard to believe, but it is 100% true. Building a gun can give you an immense amount of knowledge about how a gun works. It really helped me get a better understanding of how a gun is put together the way it is. At this point in time though, I didn’t want to tinker with it and try to figure it out on my own. After watching a quick YouTube video, it was go time. Pushed the two pins out on the back, opened it up, slid out the back piece and slid in the brace. Boom! In less than 30 seconds, it was done. No tools! Even my daughter was impressed by how quickly the gun was transformed by adding that Dan Haga Designs brace and boy did it make a big difference. Yep, just two pins and no tools! Next was the barrel. Pretty similar story. Pop one pin out, remove the handrail, push down and twist the hoop lever/handle that held the standard 556 10.5” barrel in place, pull out the barrel, insert the 6.8 SPC 16” barrel, twist the handle until it clicks and stops, put the handrail back on and reinsert the pin. Maybe one minute, two minutes tops. It was so easy and simple. I’m pretty sure my 8 year old daughter could do it now that she’s seen it done. It was time to put the ACR to work and take it to the farm. But first, one little note. The 6.8 barrels we got from Bushmaster were 16 inches, the only length they sell at the moment. Installed in a braced pistol that length doesn’t make any sense, of course. We had them cut to 12.5″, but not before I went on this hunt. Can you blame me? New gun day, time for a proof of concept! The barrel cut can wait! Jonathan has the whole story if you want to learn more about pistols vs. SBRs in 2019. One pin, no tools and we go from 5.56 to 6.8. When we got to the farm my father-in-law gave me the scouting report on the hogs and it wasn’t good. To make a long story short, the hogs had been devastating his crops. He had an 80 acre field that was COMPLETELY wiped out in the first 48 hours after they had sown it. It was time to hit the field. The Bushmaster ACR comes with an AAC 51T mount which fortunately is also the mount for my AAC SDN-6 suppressor. I was thankful that I zeroed my reliable Pulsar Trail XP50 before coming to the farm so when I got there I could hit the ground running. Or in this case, hit the pigs who were running on that ground. My 6.8 SPC magazines were loaded with Maker Bullets 6.8 95gr T-Rex ammo and I headed to the field where my father-in-law killed 3 hogs over the last several evenings with his 22-250 bolt action rifle. 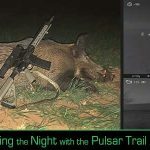 Sure enough, there was a group of about 30 hogs that my Pulsar Helion XP50 picked up in the middle of the field. With the wind coming out of the north, I raced south down the east side of the pasture until I was slightly ahead of the hogs. They were about 325 yards to my west when the truck stopped. With the wind in my favor and less than a quarter moon glowing everything was in my favor. The hogs were moving from north to south and my path was running parallel as the gap closed. The unsuspecting swine were within about 75 yards, the ACR pistol was quickly set into the cradle of my Primos tripod. Once the sow closest to me was in the crosshairs of my Pulsar Trail, I slowly started pulling and pulling and pulling the trigger (the trigger is the first thing I would upgrade on an ACR) until BAM! Shot her right in the neck and quickly swung to the next pig and fired again. Miss! Fired again, hit and that hog went down. The rest of the sounder made it safely across the field and back into the trees and it was the last I would see them in this field on this trip. Two hogs down in this field and it was time to go to the next one. Funny thing… Thankfully Pulsar thermal works well enough that even when I fail to focus I still score. Remember that 80 acre field that we talked about earlier? Well, the guilty culprits were found later that night. Cruising down to the river, I decided to check the fields that were next to those 80 acres and found a group of about 75 hogs. They were relatively close to the road, so it was surprising that the sound of the truck driving on the highway didn’t spook them especially since the wind was in their favor. What happened next was perhaps my best shooting performance ever. I really thought they were seconds away from bolting so when the truck stopped, I never grabbed my tripod because in my mind, there wouldn’t be enough time to set it up. The closest hogs were only about 50 yards away while the rest were much further back. After finding the biggest hog closest to me, I took a deep breath, exhaled, and fired. She dropped the rest scattered. Fired at a second pig, missed. Moved to another and squeeeeezed that trigger and that one somersaulted. Done! Fired another shot at the second pig and connected. Four shots fired and three dead pigs while shooting offhand… I have to say I was feeling pretty good and it was time to call it an evening. As I pulled up to the house, I saw a boar that was between 600-700 yards from the back porch. This hog became my nemesis for the next couple of nights. I could never really get close because of the way the wind was blowing but I would eventually get the best of him. On the second night, there weren’t a lot of pigs out but I did get another nice kill. The fields by the river have been really good to me lately and that continued with this bobcat. One thing I love and have mentioned before is that bobcats think they are safe in the brush. In most cases that is probably true but as I was cruising down the secluded road, my Pulsar Helion detected a sliver of heat. I wasn’t 100% sure what was lurking in the brush but it had been a slow night so I made a quick u-turn. Sure enough, it was a bobcat. A car hit a deer in the last couple of days and this bobcat was snacking on it. When I pulled up, it had retreated about 15 yards into the high grass and brush. The bobcat reminded me of like a sumo wrestler trying to hide behind a lamppost. Yes, they were both hiding but it’s definitely in plain sight (especially with any sort of thermal optics). After positively identifying the bobcat, I shot it and decided to grab it in the morning. And just like the night before, when I got home, that boar was behind the house. The wind was still keeping him safe. On the third night, my nemesis the lone boar made a mistake. As you know, the wind can make or break a hunt and most of the time we want the wind coming out of the south for the fields we hunt. For whatever reason, the whole time I was at the farm the wind was out of the north which really eliminated my stalking that hog from the house. On this night, I am on the country dirt road west of the house and this huge boar is in the road. And he is staring at me. Neither one of us panics. I’m thinking he’s about to jam. He’s only 25 yards away from the truck and the lights are shining on him. He casually but briskly starts walking to the east. While he definitely knows I am there, he is not bothered by my presence. Not having the element of surprise, I expect him to start running like any smart hog does in these situations but he never does. His slow jog continues and he is now right outside my window. Not having enough time to grab my tripod, I quickly get him in the Pulsar crosshairs and shoot. Honestly, it’s a horrible shot. It was WAY further back that I would have liked and I fired again. This boar ran about 20 yards and tumbled. Even though both shots weren’t great, the Maker bullets did their thing. He wasn’t the last pig I killed on this trip but it felt really good to get this one. I was really happy with this Bushmaster ACR in 6.8. Outside of the big boar, I never shot a pig more than once on this trip. The fact that you can swap out and customize it without any tools is incredible, especially for a guy like me. To me, the ACR is the ultimate grown up Lego set – A customizable set of Legos that can kill hogs. That’s my kind of toy. 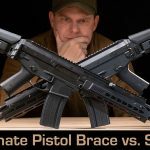 Braced Pistol Vs. SBR 2019 – Game Over? This entry was posted in The Accidental Hunter - Jared Hilton and tagged 6.8, ACR, Bushmaster, Hog Hunting, Maker Bullets by Jared Hilton. Bookmark the permalink.